Nikolas Cruz spent six minutes and 41 seconds inside the building, If, students on the third floor had had more warning, or if law enforcement had the information to act faster, they might not have died, according to an investigation by the South Florida Sun Sentinel. A couple of recent graduates from the Chicago’s Booth School say they have a way to make security cameras more effective tools to help information travel faster if there is a shooter in the building. No one was monitoring the security cameras at Parkland, according to the Sun Sentinel. At $20 per month per security camera, the students, who named the company Aegis, have developed AI software that watches security cameras, identifies guns and sends information into whatever information system an institution has developed. For a school with 100 cameras, that would be about $24,000 a year. 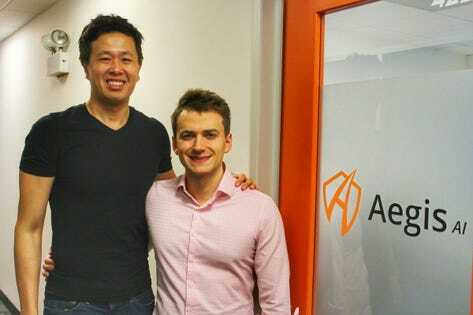 “We can draw a box around a gun with AI,” said Sonny Tai, an immigrant from South Africa who came to the United States with his single mom, served as a U.S. marine for nine years (he enlisted after 9/11 happened while he was in high school) and founded Aegis AI about a year ago with Ben Ziomek. It’s one of dozens, hundreds or thousands of companies and solutions that have cropped up in recent years to market solutions to schools and other institutions where administrators and executives are fearful of gun violence, especially mass shootings. Last spring, I wrote about new system, one of several on the market, that is being tested to detect weapons through clothing and soft luggage. The Liberty Defense system will likely cost $50,000-$100,000 per entrance and will likely be tested first at stadiums. Tai and Ziomek met at the business school. The company has landed $300,000 from some top venture capital firms, including MetaProp, a New York City-based real estate technology VC firm, Makan Investments, which invested in ClassPass, and Dormroom Fund, a student entrepreneurship fund run by Slicon Valley’s First Round Capital. The duo said they have also received investments from 14 angels. Ziomek worked at Microsoft for four years, where he worked on an AI-powered sales process that helped push revenue in his division to more than $100 million. He also worked in venture capital, investing in AI startups at Chicago-based OCA ventures. “I decided I was much more an operator than an investor,” he said. The two reached out to a YouTuber who runs a channel called Active Self Protection ,which includes video clips of gun fights, which are then analyzed for lessons learned. The channel enabled Aegis to use 500 videos to develop its software. Ziomek said. With about a dozen cameras running – Ziomek and Tai said they have verbal commitments from their first 10 clients and are testing their product in two schools – they have a failure rate of about one false positive a week. “Pretty much every automated system has false positives,” Ziomek said. The other challenges are making sure that the data collected by AI is transparent and immediate for the people – perhaps a chief of security or local law enforcement – that would actually act on the information. There are significant questions about any of the solutions in the booming school security market. Many are untested; and from a public health perspective, investing even $24,000 in, say, half the salary of a reading aide might make a lot more sense. The chances of any school being involved the target of a mass shooting is infinitesimally small. “The total available market for our technology is likely significantly higher than what we had estimated, as we weren’t able to include every possible use-case of real-time threat detection. In the time that we’ve been operating, we’ve also received positive feedback from hospitals, religious institutions, logistics hubs/distribution centers etc., which have not been included in our original model,” Tai wrote in an email.